Welcome to the No Straw, Please project by Viola and Reese! Our project started in 2018 after we met for the first time on North Beach in Point Reyes National Seashore. We both love nature and animals and it makes us sad to find so much plastic on our beaches and in our oceans that is hurting sea life. We started this journal to keep track of the work we are doing with our project. During our beach clean up we found 13 straws on the beach and a bunch of other trash. Including a dog poop bag, shotgun shells, clothing, and lots of other single use plastic materials like cups, bottle caps, and lids. After our beach clean up, we got some help from our parents so we could do some research about the dangers of plastic and plastic straws in the ocean. Reese learned that 500 million straws are made every single day, we use straws once and then throw them away. Most straws end up in landfills and the rest end up in the ocean where they don't decompose and hurt animals (like this sea turtle). Viola learned that 18 billion pounds of plastic end up in the oceans each year. Many of the straws we throw away get into the ocean! Straws break into smaller pieces which is easier for animals to swallow. Our research helped us prepare presentations for our classroom. 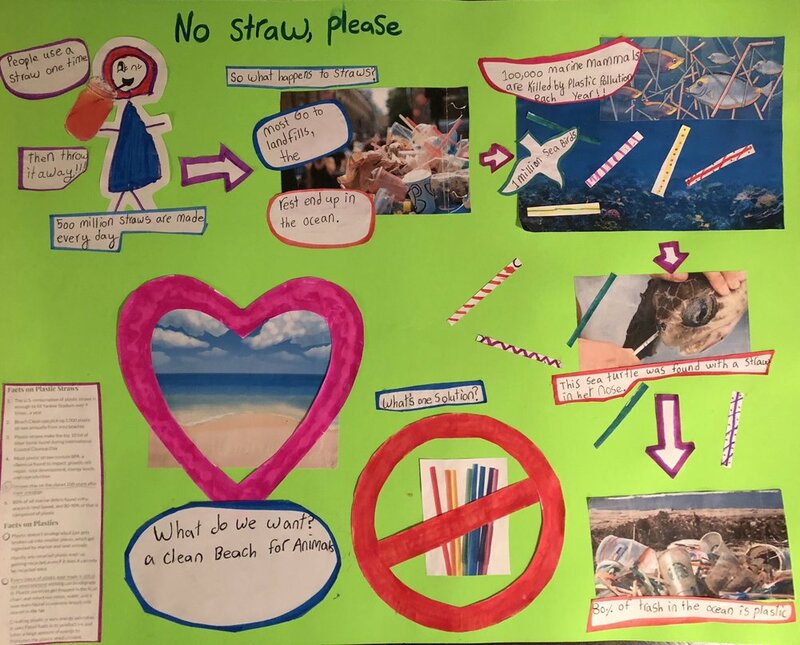 Reese designed a poster to help her explain what was bad about straws to her class and left the poster with her school for a week. Viola says her class loved that she is trying to ban plastic straws in Point Reyes. She got to write her speech and she thought that was fun, and she had a great time doing her presentation. After our presentations, our fellow classmates all signed pledges to support our project and most importantly to not use plastic straws anymore! During the next part of our project, we will meet with some local businesses and ask them to no longer use plastic straws and to provide straws upon request to customers. Our goal is to reduce the number of plastic straws that are being given out at the local restaurants in West Marin to reduce the amount of garbage and plastic that ends up on the beach. A clean beach for animals! Newer PostHog Island Oyster Company says No to Plastic Straws!